DC’s own Wale (pronounced Wah-Lay) fuses homegrown go-go beats with deft wordplay. His animated delivery,candid lyrics and clever references to current events, pop culture and the state of hip hop make Wale a force to be reckoned with. Wale was born to Nigerian immigrant parents, attended 7 different high schools, and was a bad ankle injury away from playing D1 football. Wale dropped out of Bowie State University to pursue his music dreams full time. To get by, Wale worked day jobs at the likes of Sprint and Locker Room. Local radioplay, a 2006 “DC Metro Breakthrough Artist of the Year” award, sharing the stage with Lil Wayne and TI and features in Fader, The Source and The Washington Post among others created Wale’s buzz worthiness. 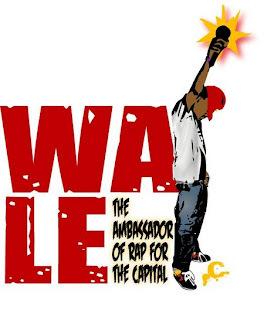 His big break: in early 2007 Wale toured the UK with distinguished producer Mark Ronson. The great feedback from audiences landed Wale a deal with Ronson’s Allido Records- Interscope. A series of mixtapes, impressive remixes, and collaborations with Nike, LRG, and Jordan Brand have displayed the DC based MC’s artistic versatility and cross sell appeal. Wale is featured on an unreleased version of Lilly Allen’s “Smile,” has rapped over Justice tunes (see below), teamed up with Lil Wayne and 9th Wonder, and recently dropped by Travis Barker’s studio to drop a few lines on former Blink182 drummer’s solo effort. Wale is also featured on a remix of MIA's "Boys"
Rolling Stone may have put it best: “Wale has more crossover appeal than weed.” The relentless buzz and the anticipation of his debut album (due soon) sets the stage for an inevitable breakthrough, one that will achieve Wale’s native goal: putting DMV (DC, Maryland, Virginia) on the hip hop map. In the meantime, he'll continue to get his U Street on. 202 Beatdrops: Bum Rush The Boards!